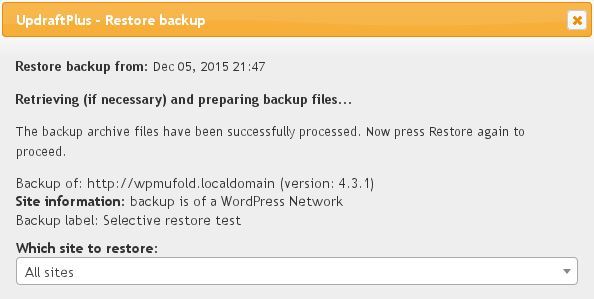 UpdraftPlus 1.11.20 onwards (release: December 2015) allows the owners of WordPress Networks (a.ka. WordPress Multisite) to restore single sites. i.e. You can restore a single site from the network, whilst leaving others untouched. This is great for keeping things simple, and especially useful if one of your sites gets mucked up but you don’t want to roll back the entire group of sites and lose changes on other sites. To use this feature, simply press the “Restore” button in UpdraftPlus in the usual way. After the backup is downloaded and scanned, you will be given the choice of which site to restore, as in the screenshot below. You have selected the option to restore your database, or uploads. This is because all other file entities except uploads (i.e. media) are shared across all sites. A WordPress network only has one installed set of plugins and themes (though, of course, different sites may have different ones marked as activated (which is in the database) – but, the files on disk only exist once). (N.B. On WP Network installs that started life before WordPress 3.5 (released December 2012), media on secondary sites is stored in the ‘Others’ backup, and the option will show if you select this entity, rather than ‘Uploads’). If you choose “All sites”, then the entire backup will be restored – everything on the network should then be restored back to its previous state. If you choose one of the individual sites from the backup, then only tables and media belonging to that site will be restored. (For those interested in the internals of WordPress, that means the tables with the site ID prefix, and media in the specific sub-directory of your media folder belonging to the site). If you choose to restore the “main” site (i.e. the ‘default’ site), then you should be aware that this can include some site-wide settings. Under the bonnet in WordPress, there’s nothing stopping plugins and themes from storing their settings anywhere – and some, which are not written to be multisite compliant, may store their settings in the “main” site, instead of specifically in the part of the WordPress database reserved for site-side settings. The same can be true for media as well as settings. WordPress core itself certainly does store things where it’s meant to, and popular, widely used plugins, are of course, are more likely to be fully multisite compliant. Since these things are under the control of third-party plugins/themes (of which there are over 40,000 in existence! ), if restoring your “main” site affects non-main sites, in respect of some plugin or theme, what support can be provided in this scenario from UpdraftPlus is very limited. The power of the WordPress plugin system is that more-or-less anything can do anything. Don’t let this warning put you off; most plugins are well behaved!